The first half of 2016 (January to June), the average is 21.6 million won per 3.3㎡ Seoul Korea new apartment sale price. 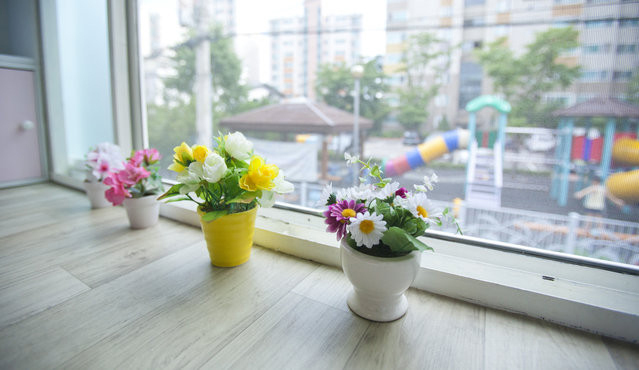 The first half of 2015 (January to June), the average is 16.9 million won per 3.3㎡ . So, This amount rose to 4.69 million won per 3.3㎡ (28% rose). Gangnam-gu new apartment(Sinbanpo Xi, Raemian Blesstegy, etc ) make to rise this. Gaepo Raemian (40.4 million won per 3.3㎡) , Ilwon-dong Raemian (37.7 million won) led the sale price rises. Seocho-gu (34.2 million won), Dongjak (22.8 million won), and Yongsan (22.5 million won). Gwangjin-gu rose 16% (17.9 million won per 3.3㎡). Eunpyeong-gu also rose 13% to 15.88 million won. 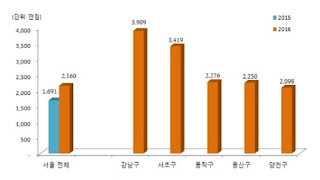 On the other hand, Seodaemun-gu fell 1.7% (19.1 million won per 3.3㎡).